This morning, I felt a bit ambitious and decided to dig through a jewelry box that I hadn’t looked at in a while, to see if there were any pieces I wanted to clean or maybe take to my favorite jeweler and repurpose with a new design. The jewelry I keep in this box is more of the memento kind—jewelry passed down that is not really my taste, or jewelry I bought years ago and no longer wear. Much of it is costume jewelry. In fact, I’m not sure any of the jewelry in this box could be considered fine jewelry. Maybe semi-fine at best. Inside the box is a blue broach that once belonged to my mother. It looks like something that came from a department store in the 50s or 60s. It’s a pretty blue, and having worked around gemologists for a number of years, I know it’s not a real gem as it is a rather odd shade of blue for a precious stone. It’s blue like the sky, late in the afternoon on a cold wintery day. It’s not warm like a sapphire, yet is too deep for an aquamarine. I’ve never worn this broach, but I’ve always liked it. I can imagine my mother wearing it when she was younger, making the perfect accent to whatever pretty dress she might be wearing. In fact, I have a vague memory—so vague it may not be real—of her wearing this with a dark blue dress that was cinched at the waist with a thin belt. I can see the broach on her chest, just above her heart. In my mind, she looks happy and flirty, and this old piece of jewelry, no doubt, has something to do with that. The item that really brought back memories—very vivid, real ones—was a necklace my parents gave me decades ago when I was in my teens. It was my first piece of “fine” jewelry. I remember unwrapping the gift and feeling completely caught off guard when I saw what my parents had given me. 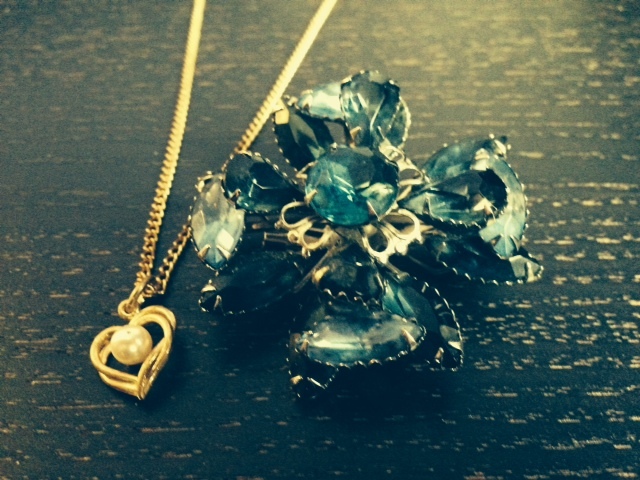 It was a gold necklace with a double heart pendant, and small pearl in the center. It was the epitome of what a “sweet” necklace would look like and very fitting for a southern girl in her early teens. I loved it instantly. It made me feel a little more grown up than I was, and pretty and feminine, and . . . it made me feel loved. I know. You can’t buy love, but that day, on that cold Christmas morning so long ago I won’t tell you (because then you can figure out my age) I opened a present from her mama and daddy, and for just a second, all in our world was as it should be. Whatever teenage fights I had with my parents back then (YOU WON’T LET ME STAY OUT LATE!) fell away and were forgotten with the amnesia that a perfect gift brings. At some point, I outgrew this necklace; probably sooner than later. Either me or my mother, though, had the foresight to put it back in its original box and tuck it away, and over the years, despite my numerous moves, from my hometown to San Francisco to Las Vegas, to LA, back to Vegas, I carried that jewelry with me. My parents are both gone now, but if I want to feel the love they had for me, and I for them, I only have to do one thing. Open my jewelry box. American Gem Society member Christophe Danhier aims to treat every piece in his collection “as an individual jewel, unique in its beauty.” Because of his pieces’ ability to stand out in the crowd, we picked two of his latest rings for our Style Pick this week. Both are sure to be a huge hit this holiday season! First up, a beautiful 18K rose gold diamond, sapphire and ruby ring. With this ring, Danhier experimented with new color combinations hoping to create a piece that not only stood out in the industry, but also in his own collection. We love how perfectly he married the subtleness of champagne diamonds with the eye catching ability of the pink sapphires and rubies. Speaking of color, Pantone just named Radiant Orchid, otherwise known as “pinkish-purple,” the color of 2014. Danhier’s next piece showcases this trending color. This 18K rose gold ring featuring amethyst accented with diamonds is the perfect bauble for any holiday party. Plus, you will be ahead of the fashion curve while your friends scramble to find their own fine jewelry rocking 2014’s Radiant Orchid. In order to always stay the most stylish in the group, be sure to check out Danhier’s latest designs at www.danhier.com. Crowded parking lots, trunks jammed with shopping bags, gift wrapping spread all over your kitchen table, and a long to-do list. The holidays are definitely here, and gift buying is on practically everyone’s mind. If you need some inspiration for jewelry this season, we have you covered. We asked a jewelry buyer at one of the largest AGS retailers in the country to give us some insider tips on what is a hot seller in their store. Laura Barringer has been at Ben Bridge for 33 years, and has been a buyer for 27 years. Here are some of Laura’s top picks from Ben Bridge. This diamond knot pendant embodies traditional “knot” styling, yet offers one of the new multi stone centers presenting a big look for a fraction of the price of a single diamond center. 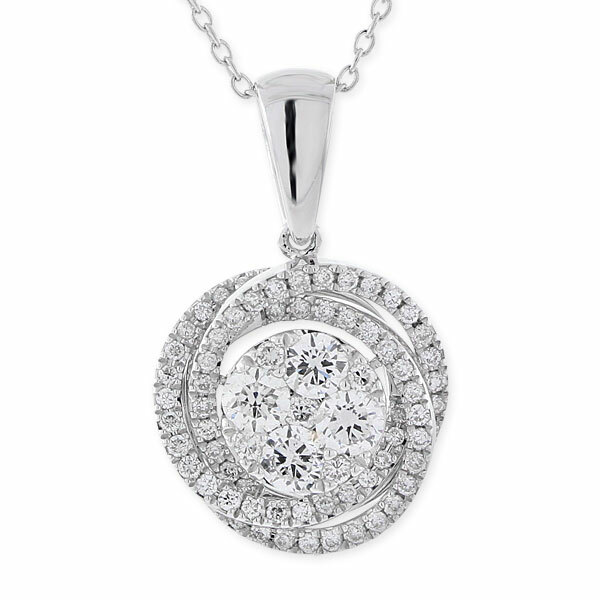 “Cluster” can no longer describe this beautiful dimensional arrangement of diamonds. “Halo” jewelry is a hot trend, and Ben Bridge gives this popular style an edgy take with this faceted, treated black diamond. The rose cut faceting was inspired during the Art Nouveau and Art Deco periods for those who may want something uniquely vintage in design. Colored diamonds continue to be popular. 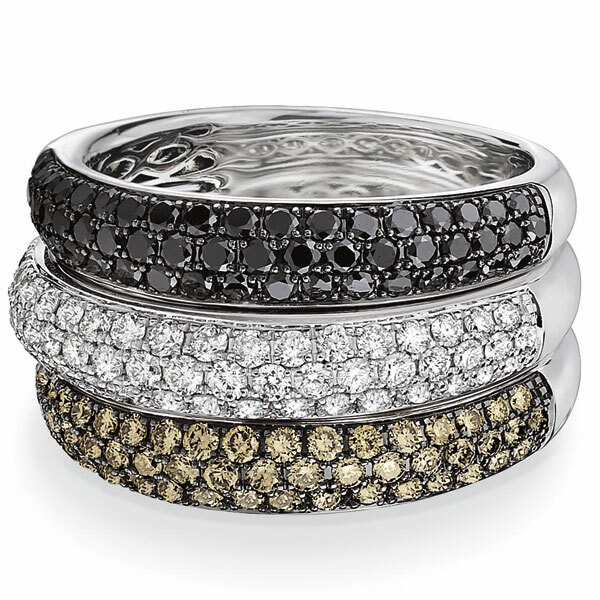 We like Ben Bridge’s layered look in three of their most popular diamond colors. 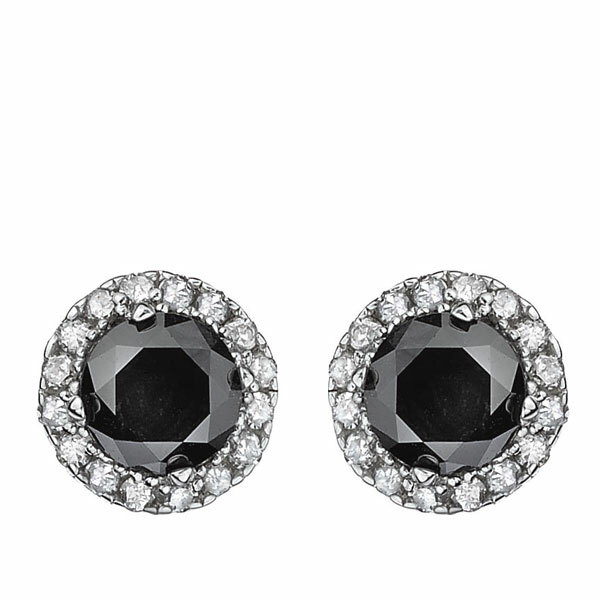 Note how black rhodium behind natural brown diamonds or treated black diamonds can enhance the look of even the smallest stone. 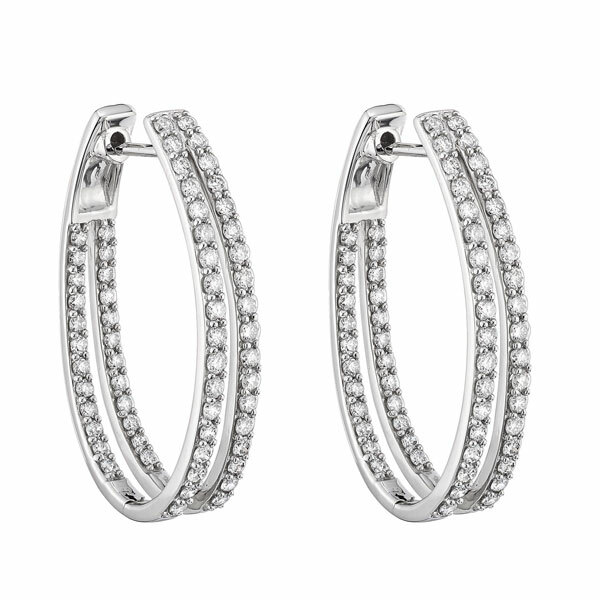 An updated twist on the most popular classic earring style: this hoop is oval in shape and “doubled.” The narrow oval shape hangs better on most ears and even though this is a substantial earring the post placement makes for a nice finished look when worn. This “renewed” version of a cluster is a nice alternative to a simple diamond stud. 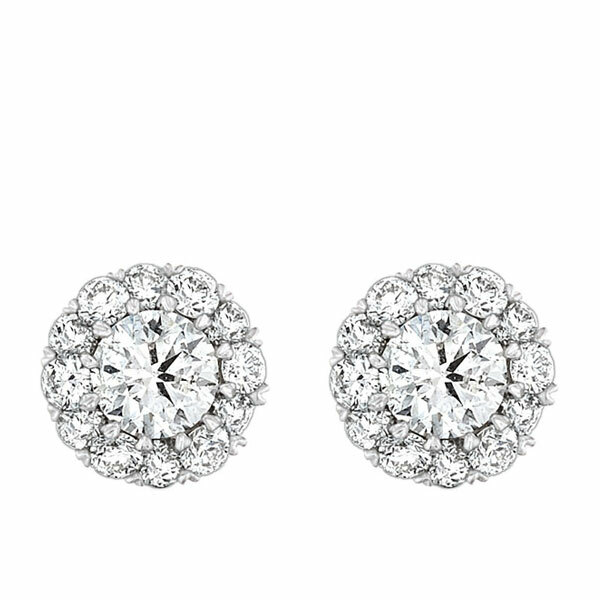 These earrings have the appearance of a 1 carat diamond when, in fact, they are only 1/3ctwt. You can find Ben Bridge, or other AGS Jewelers, on our Find a Jeweler page. Happy shopping!